Does your box need a good clean up? We are not talking about software or virus removal here! If you have noticed the dust creeping from inside the ventilation ducts of your computer to the outside, then you need to physically clean your computer to ensure no damage comes to it in the long run. Whether you are skilled with everyday tools such screwdrivers and the like or rarely use them, it doesn't matter as cleaning your computer is actually fairly simple. In no time at all, your computer will appear as clean as it did when you originally powered on your computer for the first time! FROM THE ORIGINAL POWER SOURCE BEFORE GOING FURTHER! Look at the back panel of your desktop's case. If you own a modern computer, you will likely be able to open your case via two or more small knobs you can turn by hand, or a set of buttons that you can press in to release a side of the panel (or in some cases: the entire shell of the case). Other cases may require you to remove a set of slotted or Phillips screws. If you are ever in doubt of how to remove the case, consult your owner's manual as it will instruct you how to remove it. Place the computer upside down on a stable surface. Remove the battery then remove the small screws from the removable panel (this is usually around the vents). These screws tend to be small, Phillips-like screws with many of them being at different lengths. To keep track of the screws, you may want to place them in a small glass as you remove them. Once you are looking inside of the case, ensure that you keep your fingers away from the interior of the case as you may have static electricity built inside of your fingers. Look for dust bunnies, large dust particles, and more that may be hiding inside the nooks of your case. Carefully grab these pieces of dust with a cotton swab until you have grabbed the last large piece of dust. Next, take your can of compressed air and blow around all of the components and across the bottom of the case, always ensuring the nozzle is four inches away from the machine itself. 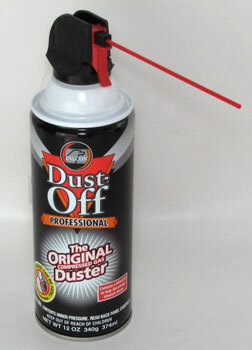 Additionally, blow quick bursts of air rather than constantly blowing the air, as not only will this help you from wasting compressed air but will also keep you from damaging your computer. When blowing the dust, aim the air so it blows the debris away from the crevices of the case. Additionally, when cleaning the fan, ensure you do not overspin the fan blades as this can damage the bearings and even crack a blade. Finally, blow air into your computer's disc drive, USB ports, and the like. Once finished, wipe the inside of the case with your light cloth and dry it with another cloth before placing the case back together. Dip one end of a cotton swab in rubbing alcohol around the openings of your case. Once finished, wipe the other end of the cotton swab around the openings of your case. With your keyboard upside down, gently shake it and allow the dust and particles that have accumulated over time to fall out. Next, blow into the keyboard and around the keys with compressed air. Afterward, dip another end of a new cotton swab into rubbing alcohol and run it outside each key. Rub the tops of the keys as well, throwing away cotton swabs when they appear to have excess dirt on them and using a new one. If you notice gunk on your mouse, remove the gunk via your fingernail if possible. If you use an optical mouse, ensure that lint or debris is not obscuring the lens in any way. For mechanical mouse users, remove the ball from underneath the mouse and wash the ball with water then allow it to air dry. Dip another cotton swab into rubbing alcohol and rub the interior components from inside the mouse, then blow compressed air into the bottom opening and allow it to dry. Finally, replace the ball and cover when dried. For monitors, a lint-free cloth will suffice. You can also purchase monitor cleaning products at computer-supply stores - something you will want to do if you want your monitor to shine as best as possible at all times. However, keep this in mind: never use ordinary household cleaning products to clean your monitor, as this could severely damage the screen of your monitor. Cleaning your computer isn't hard to accomplish, but it is something that we rarely consider when keeping our computers in excellent shape. It isn't time consuming either, meaning there is no reason why you should never clean your computer regularly. Thus, make a habit of cleaning your computer once every few months, and prolong the life of your computer in the process! MY TV STOPS SHUTS OFF AFTER ABOUT AN HOUR WATCHING NETFLIZ OR EVEN A CD. WILL THIS WORK ON THE VENTS IN IT? Join in and write your own page! It's easy to do. How? Simply click here to return to Computer-Help.